Mr. Bartolome tells OFWS : it is more efficient to buy into a franchise with a tested product and operations, rather than start a business from scratch and learning from mistakes. 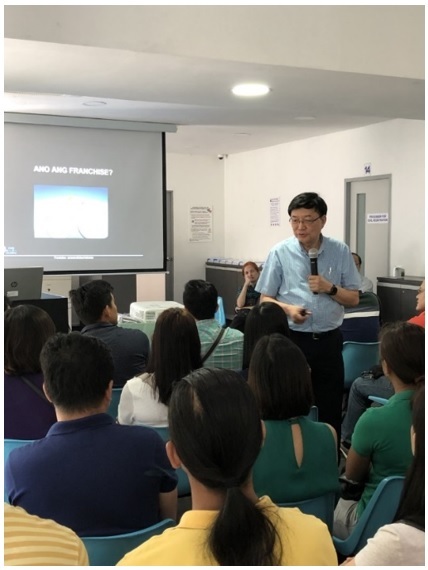 10 March 2019 – The Philippine Embassy in Singapore held a financial literacy forum on “Getting a Franchise in the Philippines,” with Mr. Armando Bartolome, who is an expert on franchising, as resource speaker. Before an audience of about 120 overseas Filipinos, Mr. Bartolome spoke on considerations for getting a franchise. His tips included doing business with a franchiser who is a member of either the Philippine Franchise Association (PFA) or the Association of Filipino Franchisers Inc. (AFFI), doing a market study, reading and understanding the franchise agreement before agreeing to sign it, being aware of bogus franchisers, and not letting a family member manage the business other than the franchisee himself. Mr. Bartolome also spoke to a group of Singapore businessmen at the forum of the Franchise and Licensing Association of Singapore on 11 March 2019. He said that the business franchise environment of the Philippines has improved greatly. The Philippine now ranks among the top 5 countries for franchise profitability, ease of doing business and ease of setting up a business. Foreign companies are now allowed full ownership of a franchise. High domestic consumption is driven by the millennial generation, who have sophisticated tastes, are attuned to global trends due to social media, and are open to small, start-up brands.